One of saddest events of 2008 (and boy there were plenty) was the passing of an actor named Ben Chapman. You'd know him better as one of the last great movie monsters of the 20th Century. And I don't recall exactly how it happened, but one day a couple of years ago, I was suddenly talking to Ben on the phone. 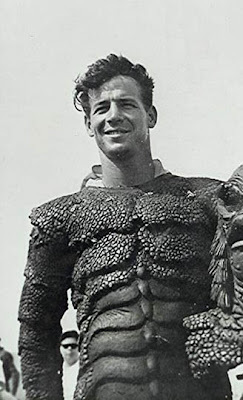 Ben Chapman was a 19 year old Polynesian Dancer, under contract to Universal Studios in 1954, when his height and size essentially made him the choice to play one of the most iconic movie monsters of all time: The title Creature in The CREATURE from the BLACK LAGOON. 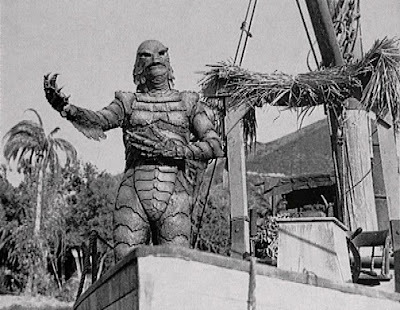 If you know anything about me, it's that my favorite movie monster (my own dark child aside) is, was and always will be, the Gillman featured in the three sci-fi thrillers of the 1950s. Like most kids my age (and that's not a typo) I was introduced to the Creature through the box in my living room that I worshipped in front of, from my earliest memory. I grew up in Northern California and Channel 3 (the NBC affiliate) had a Saturday afternoon sci-fi/horror movie slot called "CPM Theater". They played The Creature from the Black Lagoon so often that my tiny little brain back then assumed that somehow CPM stood for "Creature Movie" with some word in the middle that started with a P, that I could never figure out. 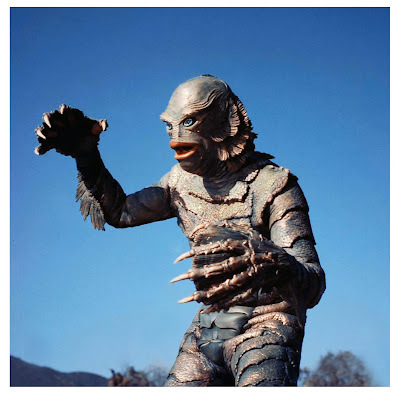 The Gillman also got plenty of air play on Creature Features which KTVU Channel 2 in Oakland, ran late Saturday nights with hosts Bob Wilkins and later John Stanley. Any kid who loved horror movies and grew up in northern California in the 60's and 70s, knows these names well. 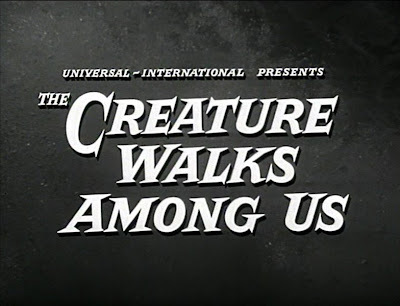 And the third and final film of the trilogy THE CREATURE WALKS AMONG US (1956) perhaps my most favorite horror movie "title" of that era. When a good friend saw Ben Chapman's website www.the-reelgillman.com (any and all Creature fans should not hesitate to visit) he wrote to the man who had donned the Gillman's suit in 1954, and in requesting an autographed picture, mentioned that he knew the director of Jeepers Creepers who was also a HUGE Black Lagoon fan. Ben, retired and living in Honolulu Hawaii, reported back to my friend that he was a big fan of the Jeepers films (especially Jeepers 2, which I ironically wanted to call THE CREEPER WALKS AMONG US) And Ben wanted to know if there was a way to get in touch with me. I didn't believe any of this at first (most polite people tell filmmakers they like their films whether they do or not, it's just a way of saying 'hello') but when Ben's raspy voice came over the phone from Hawaii one afternoon, he not only talked a lot about the Jeeper's movies and how he admired the storytelling and tone, but he described shot-for-shot his favorite scene in JEEPERS II. For the Jeepers people out there, I will tell you which scene it was, and ironically, (at the risk of tooting my own horn here) Tobe Hooper, director of the classic TEXAS CHAINSAW MASSACRE, also told me it was one of the scariest scenes he's seen in a movie in years: the scene where the Creeper hangs upside down at the back of the bus and picks out his future victims. If you think I have a swelled head for bragging about this, let me also note, it was also the scene that this filmmaker was ready to cut because I was afraid it just didn't work. It was only when preview cards came back after the first sneak we held, that listed it as one of people's favorite scenes in the movie, that I decided it should stay in the final cut. Ben Chapman knowing one of my films so well, really thrilled me. In fact, I'm not sure I can put into words how much that thrilled me. If it wasn't for the Sci-Fi Channel and the USA Network running Jeepers One and Two all the time, or the occasional piece of fan mail that gets forwarded through my agents, it would be easy for me to believe that not many people had ever seen, let alone liked the Jeepers flicks. So when Ben actually knew about the Jeepers films and in great detail, it was basically my favorite movie monster of all time telling me how thrilled he was by my own movie monster. And I mean the cosmic connection still just starts my head spinning. My first phone call with Ben Chapman was over two hours long! 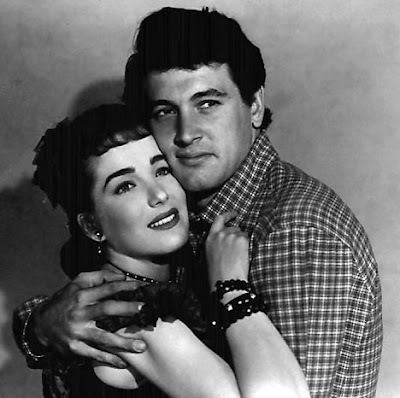 And I got not only a glimpse behind the scenes of my favorite monster flick, but I got to know the story of a handsome young dancer who participated in the world of Hollywood when the likes of Rock Hudson and Marilyn Monroe reigned supreme. And Ben had personal stories about each of them and many, many others. I asked Ben why he hadn't written a book but he said he would never put in writing the kind of tales he mentioned to me. Some were wild and some were too wild to share on a first time phone call, but Ben was clear he could never tell tales about people in the way most books about Hollywood do. And Ben never did. And I'm sure he didn't end up a rich man, and could have seen some real cash if he had decided to tell tales to generate income in his Golden Years. So there was something even more noble about his decision not to go public with his many adventures as a devastatingly handsome contract player and parties at Peter Lawford's house with the Brat Pack and other luminaries. But Ben said no to telling tales in public and that was just the kind of soul Ben Chapman was. When Ben came to a horror convention in Los Angeles, he said to drop by and meet him in person. I did, and there he was, signing autographs with Julia Adams signing next to him! 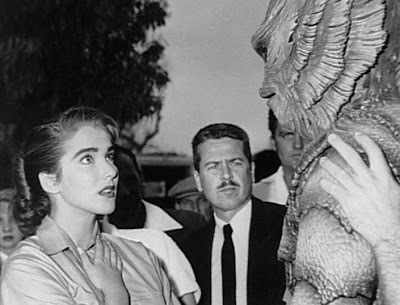 Julia was the Creature's first onscreen crush. The beauty in the stunning white one-piece (and quite a provocative swimsuit for its day) that the Creature could not forget. Ben welcomed me like an old friend and I sat between these two legends of my childhood for four straight hours, watching them sign pictures for their fans of all ages while I, pretty much awestruck, asked incessant questions of both of them. They were very gracious and polite to me, as I tried to hide the fact that I was experiencing one of my dreams come true. Julia had an incredible career as an actress outside the lagoon that I was not aware of until we started talking. This drop dead gorgeous actress, her beauty which was still very much in evidence by the way, starred opposite Tyrone Power, Glenn Ford, Tony Curtis, Rock Hudson, Jimmy Stewart, Charlton Heston and even Francis the Talking Mule! She said that back in the 50s, getting assigned a sci-fi or a monster movie was considered a real step down, something people did when their careers were on the skids, so she resisted doing CFTBL initially. There was a somewhat disastrous design of the Creature's head, that almost made it into the final film. 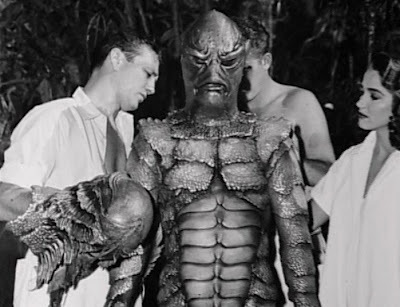 But a screen test at the eleventh hour convinced the studio head (no pun intended) that the look of the creature did not work --and the head was redesigned and became the classic Gillman we know and love today. 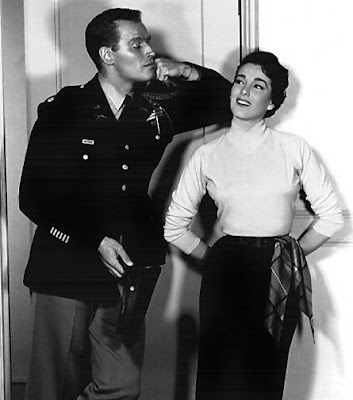 It was strange to hear all the major roles Julia had in her long career, and yet I only knew her for her work opposite the Gillman. And I asked her, in all sincerity, what it felt like, after all the films she'd done, to be remembered most for her work with "that man in a rubber suit"? She really thought about it before answering and she looked at me and said, "Victor, it taught me not to take the world too seriously." For me, Julia was one half of one of the most memorable and poetic moments in all of horror movie history: when the Creature first sees Julie she is swimming in his lagoon. He watches, then approaches and starts to mirror her swimming, directly under her, while she is completely unaware. As this unique and strange little "love dance" plays out, the Creature gets more inquistive and attempts to touch this new and incredible thing that has entered his home. This is a piece of film poetry in the middle of this 3D (in its original release) monster movie, that is one of the reasons it stands out as perhaps the most interesting, believable and intelligent entry of the creature features of that era. But I didn't know how indelible that swimming moment was in my own mind, until I was shooting JEEPERS CREEPERS in the sweltering heat of Central Florida. I had written what I thought was an incredibly creepy and strange moment in the film, when brother and sister Trisha and Darry Jenner, trapped in a dark police station, take refuge from the Creeper in an interrogation room. The beautiful Gina Philips (playing Trisha Jenner) is completely unaware that the Creeper is watching her, studying her through a two-way mirror and even pressing his nose to the glass directly in front of her as he follows her movements with his own and tries to catch her scent. We were all pleased with how the shot was working and after a few takes it suddenly occurred to me what I was watching: my own little homage to the scene in Creature from the Black Lagoon where Julie swam, innocently unaware the Creature was just an inch away, moving with her and intoxicated by her. 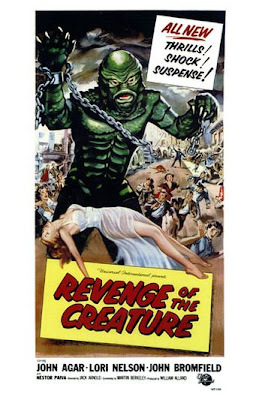 My favorite of the three Creature features back when I was a lad, was definitely REVENGE OF THE CREATURE. I couldn't get enough of that one. Something about taking the Creature out of the Lagoon and bringing him to a Marine World Sea Park in Florida thrilled me like none of the other two Creature flicks. The Creature was thrown into our world. And was put in a tank for public display while being fed like some dolphin in a cage. But the movie was also the scariest of the three because by chaining the Creature to the floor of this underwater tank, they created all kinds of suspense every time the scientists came down into the water, to try and tame the deadly manfish. Because you knew that chain could snap at any moment and set the Creature loose on them! As a kid, I was terrified for these brave scientists who swim down and try to cattle prod some manners into him. Looking at the film now, the cruelty these scientists treated the Creature with, tempting him with food and then shocking him when he would reach for it, while screaming the word "No" at him with a bullhorn, seems utterly savage and sadistic. 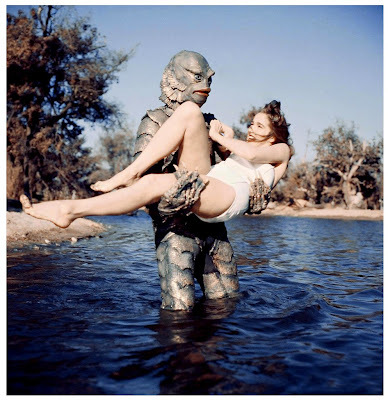 Sure they were foreshadowing the climax of the film where they would again use a bullhorn to shout the word "No" at the Creature, to try and save the hot young scientist in his clutches (the lovely Lori Nelson) but taming the Gillman or any animal this way seems almost unconscionable. This was hilariously pointed out when Mystery Science Theater did their pass at Revenge of the Creature when their series moved to the Sci-Fi Channel. Please release this episode of MST3K on DVD. I almost wet myself watching that one. And that says a lot being I usually don't like people poking fun at my Gillman. The Gillman's chain does finally break of course and he breaks loose in the second act and goes rampaging through the crowded amusement park as the crowds flee in the obligatory "crowds are screaming and panicking" scene that so many classic 50s monster films had. The sequence was topped off with the creature walking across a highway and flipping a car on it's side to get to the beach and back to his precious watery home. But the Gillman doesn't go straight home. He has become obsessed with the stunning blond scientist who was one of his tormentors in the tank. The Creature may be the horniest or at least the lonliest monster on record. His prime motivation was always just wanting the cute girl. Well, we can all relate. Though as an innocent kid unaware of his own little gay hormones swimming around inside him, the sexual implications of the creature wanting these women for mates never occurred to me. Not even when the Creature walks up to the scientist's oceanside apartment and watches her disrobe for a shower. This was just a great scene of the Creature in moonlight staking out his target. I was too scared to wonder for what purpose! The cute scientist's poor dog gets the raw end of the encounter while she is in the shower unawares. This again made Revenge my favorite film, so many strange scenes where the Creature appeared where you wouldn't expect him. Like the strange but absolutely wonderful moment the Creature walks down a moonlit wharf to a dinner and dance club, and to some really swinging jazz. He walks right into the club and snatches his lady love right out of the Twentieth Century and dives with her back into the ocean! 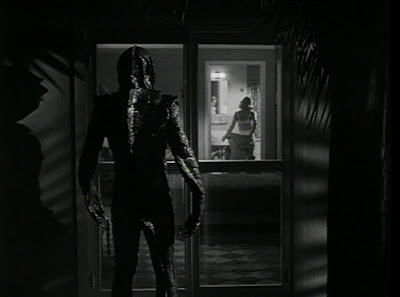 REVENGE OF THE CREATURE was my favorite back then (not so much now) because the Gillman got to interact with cars, teenagers, policemen, dogs and technology and was extra scary because of it. It is a template often imitated now: I'm sure you can think of plenty of other movie monsters who have been misplaced into our world for a new twist on an old scare. As mentioned in a previous blog, my favorite poster, the one that adorned my bedroom wall for many years (right next to a stunning John Romita SpiderMan poster that I wish I still had) was a still from REVENGE where the Creature is leaping out of the tank as part of his escape. There was a joke caption on it that I didn't care for (and for some reason didn't think to just snip off) but it also points up, and here comes my movie monster nerdism taking over: the alterations they made to the Gillman's suit and especially head for REVENGE. The great fish eyes are gone in REVENGE and the whole head seems to have changed shape and been made into more of a mask, a mask with much less artistry and sculpting and with little or no articulation. This didn't bother me as a kid but is dramatically apparent now in watching the films. I even read an article that rumored Ray Harryhausen had something to do with how the Creature looked. Ben Chapman says he gives the lion share of the Creature's look to Jack Kevan (who was part of the team of geniuses at MGM who gave us the brilliant flying Monkeys in the original Wizard of Oz) Ben claims Kevan, not Westmore put Ben together piece by piece as the costume was created and finalized. Ben has said publicly that Jack's enormous contributions were overshadowed by department head Bud Westmore. Others in the know say it was a talented woman named Millicent Patrick who arrived at the final and stunning blend of mammal and fish. 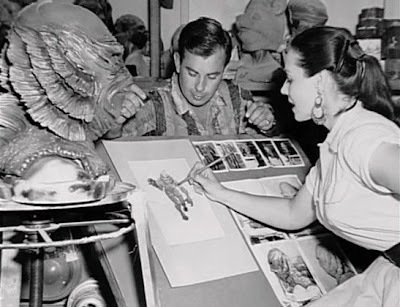 One of the great movie authorities about that period at Universal, Bob Burns says the Creature was her brainchild and resembled her sketches perfectly and Millicent went on a publicity tour for the first Creature film as the "lady who created the monster." If you weren't aware, there were actually two different Creatures in two different suits playing the monster in the original film. Ben Chapman, at 6 foot 3, played what fans call "the Land Creature"
Ben described the land suit as a big, one piece body stocking (with carefully scultped rubber scales) that took him two to three hours to get in and out of. 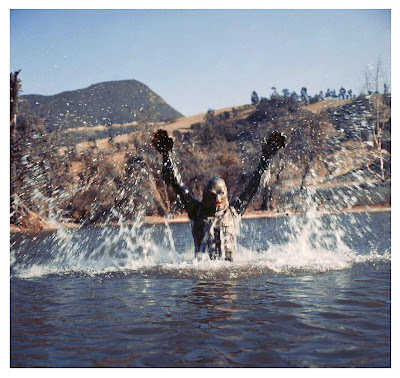 The underwater suit differed from the "land Creature" suit mainly because Chapman and Browning were two very different sizes. Most startling, especially to me as a filmmaker, was that the movie was shooting on two different coasts and at the same time with two different casts. 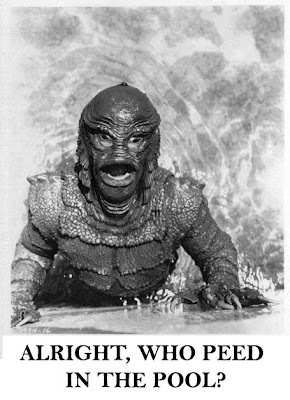 The principal actors shot here in Los Angeles at Universal under the direction of Jack Arnold, and across the country, in the clear Spring Waters of Central Florida, a team of stunt doubles and the underwater creature were shooting the underwater part of each scene. This sounds like a nightmare to me as a director, not to be able to direct half the shots in key sequences, and trust those shots to another director across the country. 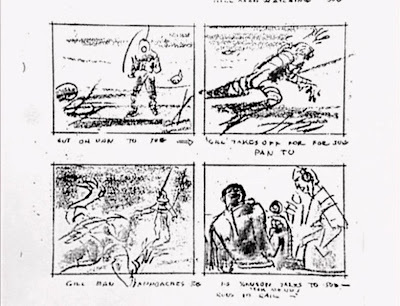 I am sure that the reason it worked as well as it did was Jack Arnold's precise vision for each beat of the story and his detailed storyboarding for each sequence. Jack must have been a Hell of a planner and one talented guy who could see each shot he needed in his mind. 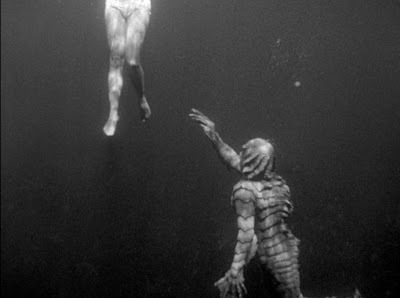 Hard to believe that the Creature is swimming under a double and not Julia Adams in that great scene swimming sequence in the film, or that the speargun toting scientists who plunge into the depths of the Black Lagoon and do battle with the Gillman aren't Richard Carlson or Richard Denning. Nor are they directed by the film's director, Jack Arnold, but rather by the man who supervised all the shooting in Florida, James C. Havens. It was like there were two alternate Creature universes co-existing and shooting hundreds of miles apart, to eventually come together and combine to make one classic movie. Jack Arnold, a gifted director who never really got the spotlight he deserved, made a bunch of sci fi horror films back then. While each of them were strong in their own way, Jack's film adaptation of the terrific Richard Matheson story, THE INCREDIBLE SHRINKING MAN, is probably considered Arnold's masterpiece. And it is quite amazing. Stunning. And in my humble opinion has one of the greatest sci-fi endings of all time. Land creature Ben Chapman said Jack Arnold was a tough no-nonsense director who had only one note for the young actor about how to play the Creature. Jack said, "Don't make a cartoon out of him." 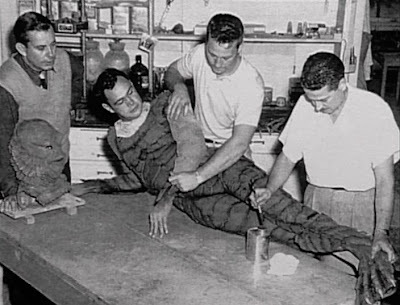 Ben also said that Arnold had the Land Creature suit fitted with 10 lb weights to discourage the actor from plodding around when the Creature walked on land. 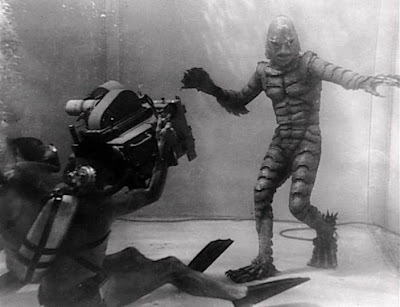 Ben said this forced him to glide and slide those big flipper feet and for Arnold it was a way to keep the Creature from plodding through scenes like a man in a very "bendy" rubber suit. Ben told me the only real mishap during shooting of the original CFTBL was due to the restricted vision the Creature's head provided the actor. He was carrying the lovely Ms. Adams through the Creature's cave set in one scene, and knocked her head into one of the artificial rocks . 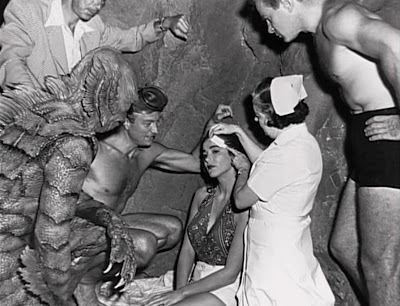 I still have to laugh at the great picture taken on that day as the actors and director and set nurse attend to the injured Julia --with the Creature looking equally concerned for her well being. Several people who know of my love of the Lagoon have recently sent me the pictures from a Life Magazine spread that Ben Chapman and Julia Adams did during the production of the first film. I had never seen these rare pics in my life until just recently and am sharing a few here. Click on the image for a larger version if you want to use them as your computer desktop. I have some more so let me know if you'd like to see the others. I think seeing the Creature in true color (not the garish color shots created by the publicity department) is quite a shock. When shooting black and white, things were painted a certain way because of how they would translate to black and white film. And the Creature's color, looking like a sort o dull grayish-blue in these pics, must have been the right pigment to give him his dazzling texture in his black and white universe. Even those gills popped out at you in black and white 3D. 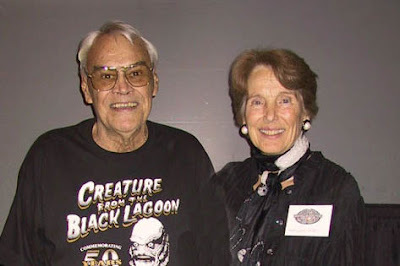 The music from CREATURE from the BLACK LAGOON was a miracle of invention and necessity. While some cues were borrowed from other Universal films, the original score was the product of three composers assigned to different scenes. Believe me: this is NOT the way film composers like to approach their work. 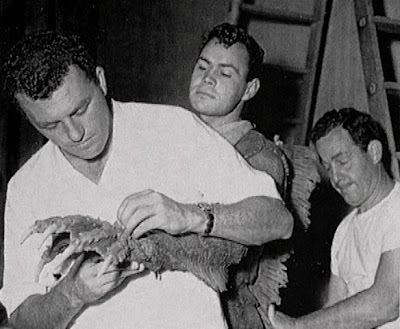 The musical voices in Lagoon were first, Herman Stein, and his flutter trumpet Creature theme that the producers demanded be heard almost every time the Creature is seen. 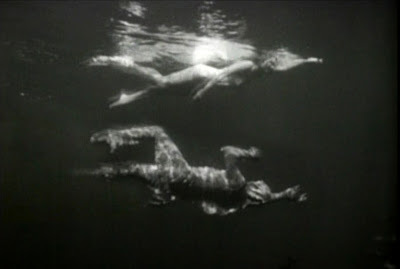 Stein, a little known movie music mega-talent of that era, also wrote the terrifc piece that accompanies the swimming scene with Julia and the Creature. The other contributing composers, all under contract to Universal at the time, were Henry Mancini and Hans J. Salter (who has given some of the Universal Movie Monsters many of their great musical moments. Cues from The Wolfman and Ghost of Frankenstien and even cues from the Jimmy Stewart western BEND OF THE RIVER were also used. The music was rerecorded and combined with original cues from these three composers to create the musical score for BLACK LAGOON. With the possible exception of the Wicked Witch theme from the Wizard of Oz, I would have to say the Creature's flutter trumpets were probably my gateway drug into my permanent and longstanding addiction to movie music. As a skinny lad of twelve or so, I would record these films off the TV (not with a video recorder, young readers, which did not exist in the days of CPM Theater or Creature Features) but with a tiny reel to reel tape recorder. Simply to listen back to the music and sound effects and dialog. I have probably over-blogged at this point. 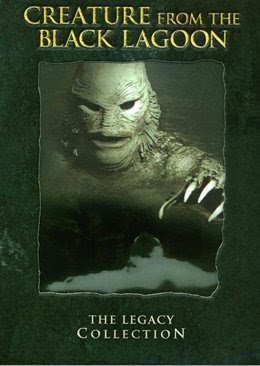 And I haven't even talked about the third film in the Lagoon trilogy or even mentioned my own futile attempts to get at the helm of the CREATURE FROM THE BLACK LAGOON remake. I had Brad Parker illustrate my ten page synopsis, complete with a suggested cast list. Easily my most ambitious pitch to make a movie ever. Submitted through my agents when the remake was announced, Universal never even took a meeting with me. Oh well. Desperately wanting to keep it from the tongue-in-cheek Indiana Jones route that Universal took their MUMMY remakes in, (to great Box Office success) maybe blinded me to the fact that the Creature's remake fate was already decided. The remake has come and gone and been announced many times over since then. I hope when it does get remade, it gets made by someone who understands the reasons why the first one worked so well. It would be smart once in a while, in the climate of remaking everything, to respect the original. Speaking of, each of the three original films has been wonderfully restored for DVD. The complete trilogy from Universal. 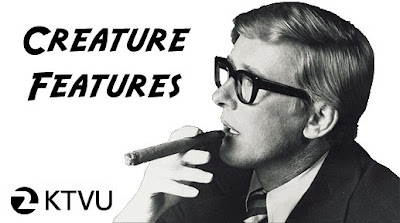 Including a terrific program about the films from other and much more knowledgable Creature fans than I. The program is written and hosted by the film historian David J Skal. This is a must for all Lagoon fans. 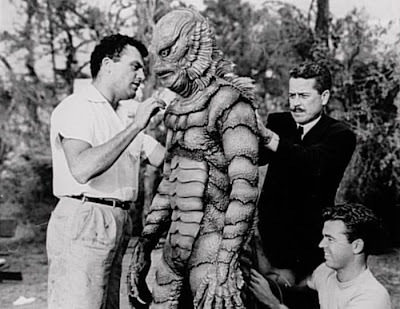 I am happy to have known Ben Chapman even for a moment, and got to shake hands with the sweet, sweet soul that was a large part of my favorite monster of the movies, the great Gillman.